CareDatix  Electronic House Call is a FDA 510(k) cleared remote patient vital signs monitoring device. This self-contained home unit is perfectly suited for patients that require frequent assessment and reminders. The medication and session reminders and video education video help patients to understand and manage their chronic illness better. This increases their care plan compliance and reduces the instances of hospital readmissions and improves overall outcomes. 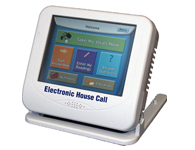 The Electronic House Call takes patient vital signs using the latest in wired and wireless peripherals and can be used on adults, children, and even neonates. Simple onscreen instructions make it exceptionally easy for patients to use without care provider assistance. Clinicians can remotely customize the session questions and medication reminders. Alerts let clinicians know when a patient’s vital signs are out of preset ranges so the clinician can remotely evaluate the patient’s condition and make timely adjustments to their care plan. Choose from a variety of peripheral devices to customize your patient’s care plan. Supported peripherals include weight scale, blood pressure monitor, glucose meter, pulse oximeter, CPAP and more.